Are Bird Mites Real? Do They Infest Homes? This image shows a mite, and human hair for scale, that was collected from a hummingbird feeder in mid-summer. The mite was carried to the feeder on the beak of a hummingbird. The dark patch visible inside the mite is hummingbird blood on which the mite had fed (this dark coloration is why the mites are sometimes called "black pepper mites"). Birds/poultry and rodents harbor a group of ectoparasitic mites (numerous, related species) that live in the animal's nest and feed on its blood. When these mites leave the host animal's nest and enter our homes, or we otherwise come into contact with them, the mites are called bird mites, nest mites or sometimes rodent mites. These mites only leave the host animal's nest if the nest is abandoned or if the animal dies. So a typical scenario might be that a bird nest located outside a bedroom window, perhaps attached to the eves, is infested with these parasitic mites feeding on the occupants of the nest. The birds leave for some reason (migration, predation, and so forth) and in the absence of their normal hosts the mites abandon the nest and enter the house in search of a meal. The same scenario can happen with rodent nests in association with homes as well. Do bird mites infest homes & people? Mites that enter homes will bite causing a irritating, itchy lesion much like a mosquito bite. However, since we are not a suitable substitute for their natural hosts bird mites can not establish a permanent infestation in homes. Generally if the source nest of the invading mites is removed the migration into the home will stop. Once the source is eliminated then simple cleaning and vacuuming (dispose of dust bag outside) of the affected room is enough. Insecticides are generally not needed. 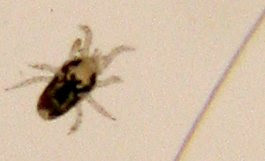 Unfortunately there's considerable misinformation about this mite's ability to permanently infest homes and people. People will believe what they want to believe but there simply is no good scientific evidence that the mites are able to survive and reproduce on our blood alone. So while they can certainly bite us, neither we nor our homes can become infested by bird mites. Finally, people who handle birds and rodents such as those that raise poultry or work in a pet store often encounter these mites. See Bird Mites at our 'Bugs site for more information.